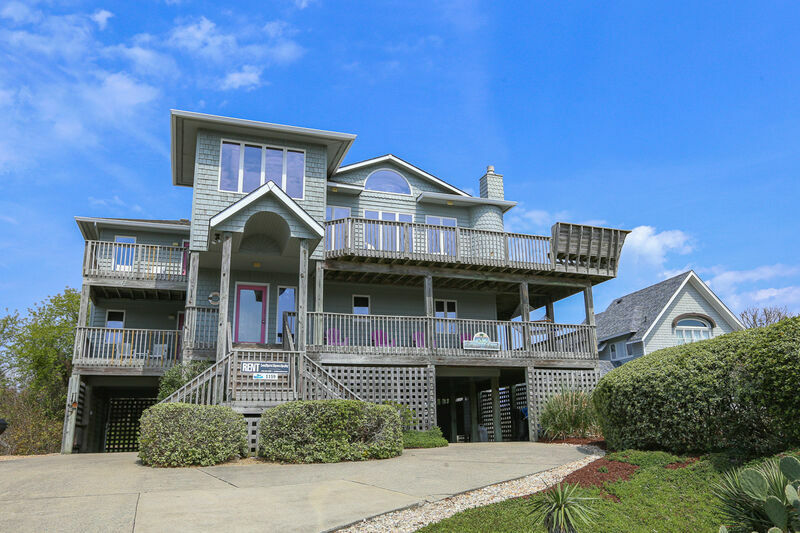 This spacious home has all of the amenities, chosen for your every vacation pleasure. The comfortable interior accentuates the aesthetically appealing Juniper cathedral ceilings and wainscoting in the hallways. Every bedroom leads out to a spacious sun or covered deck with built-in benches and deck furniture. You have a choice of eating in or patio dining on the screened porch. The second floor deck contains an eight person hot tub and a hammock for complete relaxation. This house is a one minute walk to the clubhouse with two pools, racquetball, tennis courts, and fitness center. The beach is a two minute walk in the opposite direction. Game room with full bath, PACMAN Arcade game console, CATV with DVD player, laundry, extra refrigerator, 2 outdoor showers, fish cleaning table. 3 master bedrooms (each with Queen, private baths); 1 master bedroom (with 2 Bunk sets, private bath); 4 CATVs, 4 DVD players, hot tub for 8. Master bedroom (with Queen, private bath with Jacuzzi); kitchen/living/dining great room, outdoor patio dining set to seat 6, ship’s watch with panoramic views, powder room, 2 CATVs, 2 DVD players, stereo/CD player, gas fireplace.